Recently I inquired of a patient who is living with a diagnosis of breast cancer: “what is your sense ofwhat is going on here?” She spoke of how she was aware, at least in the particular moment of responding to my question, that in recent times she had not consistently made deeply nourishing choices. I was moved by the courage and power of her insight and reminded of my own longing to slow down. As I spend this week in retreat by the ocean- I notice how well this slower pace suits me. I began my retreat with a fast, abstaining from food and speech. 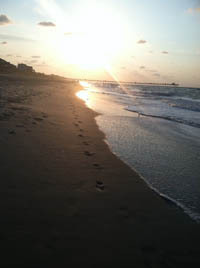 My nourishment was the ocean, sand, sun, rest and five-element punch to help cleanse and keep me stable. What I have noticed in subsequent days is how easily hours and days fill up with fun discoveries and how good it feels to rest each night. In relationship with myself and with my fellow traveller, sometimes I inquire what will suit me -and other times us- best right now? A walk along the shore, an immersion into the salty womb, a meal of lamb sausage with squash and green beans, conversations about the contours of our awareness . . . This last morning I sit with the ocean before me, I can see that this relationship between the stirrings within and life without is like the water meeting land at the lips of the ocean, the wind meeting the edge of the nostrils, the green bean the teeth, and the words of my fellow travellers and I departing from mouths and arriving a tears; each of these meetings yielding its own nourishment: a sandy place to rest and play, breath, nutrients, meaning and connection. To take nourishment for me, is to have time enough to gather my awareness at these meeting places- to allow the vibrations to move through me shaking off residue, organizing tissue, giving me vitality and soothing tender places. The pace of activity at these meeting places can often outrun my capacity to gather my awareness. And so I return to the meeting place of this patient’s insight and my ears and realize how grateful I am that those vibrations have helped bring me here today.